So you got a degree in teaching and are thinking the classroom life isn’t for you. Or maybe you’ve been teaching for years and you suddenly realize you need or want a career change. Don’t fret! If you want to do something else, you don’t have to feel fenced in by your chosen path of study or your resume worth of experience. 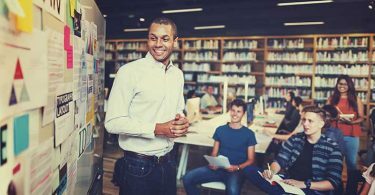 Here are a few great career options for degreed and trained teachers who would rather not teach, but would like to put their highly transferrable skills to good use. Okay, this is still teaching, but it’s more one-on-one, much more flexible schedule-wise, and the hourly pay is usually stellar (think $60–$100 an hour, depending on your subject and experience level). If you crave helping kids on a more individual basis and you want something outside of the classroom, this is a great transition. You can start by taking on some tutoring gigs while you still have a full-time job. Once you build up a solid and regular client base, it will be easier to step away from a steady teaching gig. Bonus: you can design your own hours, making this an ideal job for working parents. Here’s another option if the major drawback of traditional teaching for you is having to stand in front of a class. You can definitely keep teaching but just ditch the desks, chairs, and tables. There are more and more opportunities these days to teach entirely online, or to teach homebound children or hospitalized kids. You could even contract out to groups of homeschooled kids. The skills you’ve amassed in your education and work experience (being organized, efficient, collaborative, managerial, hardworking, and flexible; the ability to communicate with people of all ages; curiosity and a passion for learning) are some of the most highly valued in the business world. You can pump these skills up on your resume and throw your energy into all sorts of positions from sales and marketing, to HR, to management. Teachers have great communication skills and lots of experience collaborating with and helping people. If you want to switch to a role in the non-profit sector, consider a career as a grant writer. And if your passion is still helping kids (but you want to leave the classroom), seek out youth-focused organizations that help kids thrive through mentorship and education. Leave the classroom behind and switch to teaching in prisons, where you can help inmates to gather valuable skills that will help them reintegrate into society after they have done their time. Teach anything from GED prep, to art, to drama, to philosophy—use your expertise to empower and inspire. Recent studies have shown that inmates who take part in education programs are far less likely to return to prison once released. If you’ve been in the profession for a while and can confidently advise on how to make classrooms more efficient, consider becoming an education consultant. First, you have to pick an area of focus. Do you want to advise your school district on adopting a different math pedagogy? Do you have the expertise to help schools integrate more technology in the classroom? Focus on one area of strength and look for positions in your district where you can advise and shape educational practices.